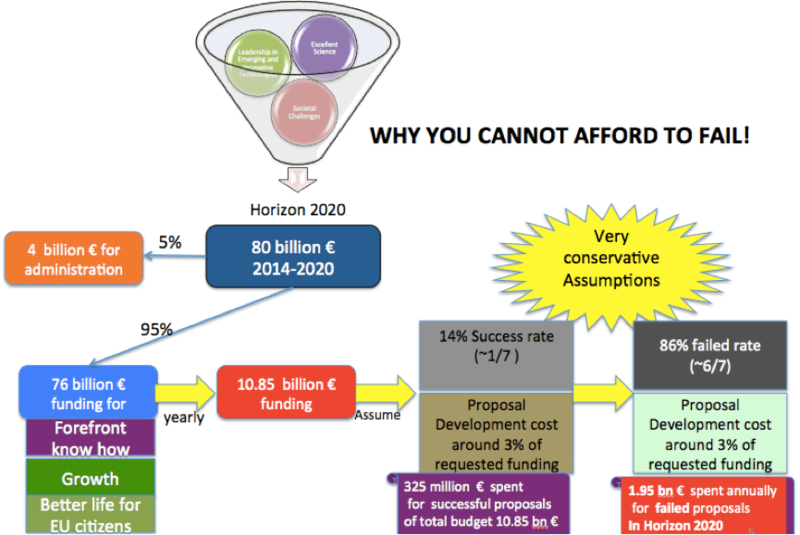 Home » Uncategorized » Why you must not fail in Horizon 2020 and how to succeed? This topic will show how much budget is approximately spent in the development of failed proposals by the European research, i.e. for proposals that do not receive any funding from Horizon 2020. There are at the beginning some simple calculations (subtraction, division and multiplications) that will show to the participants that approximately around 2 billion EUR are wasted every year in failed proposals in Horizon 2020 and then it instructs the participants on fifteen checkpoints/questions that they need to address fully by following a specific route for ensuring the development of a winning proposal. We call these checkpoints or questions “traffic lights” since the answers to these questions give the colour of the traffic light and direct us on our next action. 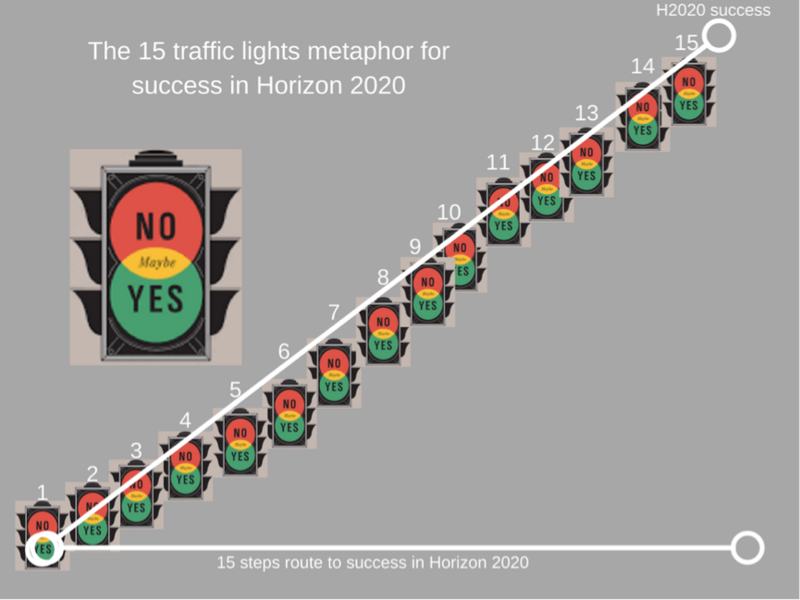 The metaphor of the route with fifteen traffic lights gives a very simple but powerful and effective way on building successful H2020 proposals. More specifically, let’s consider first the budget of Horizon 2020 (that by the way is co-decided between Council and European Parliament and it is executed by European Commission) which is around 80 billion EUR for 7 years from 2014 – 2020 and subtract now the up to 5% (around 4 billion EUR) that is allocated for its administration (costs for EC operations, evaluations, etc). Assumption 2: The cost of preparing an H2020 is around 3% of the requested funding (e.g. a proposal that requests 1.5 million EUR EC funding costed around 45K EUR for its development and submission.) This cost includes person effort of the proposal development team, any external support such as training or consultancy as well as travelling expenses for attending infodays or other proposal preparation meetings. (10,85 billion EUR*3%=0,325 billion EUR or 325 million EUR). that are spent annually for just failed proposals! The above analysis and findings are illustrated also in the following diagram. Therefore, we conclude that 1,95 billion EUR are wasted every year from the European research in failed proposals. This finding is quite worrying and alarming for Horizon 2020 actors (EC, Research and Industry) since it is very challenging for Horizon 2020 to create any significant impact as long as around 2 billion EUR are wasted in failed proposals! This brings the question! Can you do something on that as RM&As or the European research in general? Or in other words, can you do something as RM&As so that European research will ensure that its resources are well spent in H2020? The answer is simple and straightforward: Yes, you can! And let’s see in the next section how. How you as expert and the European research can really succeed in H2020? More specifically, you need to develop and follow a simple but effective process that will either lead your organisation to a successful proposal or will stop your organisation in proceeding further in the proposal development cycle before wasting money in failed H2020 proposals. The way that champions in H2020 work in order to achieve and implement such a process is they split the whole proposal development cycle in distinct steps/stages and they introduce along the process check points or in other words “traffic lights”. At each check point or “traffic light” they ask one question that they have to get a positive response (i.e. a green light) in order to proceed to the next stage. Most of these “traffic lights” should be introduced before start writing the H2020 application form and actually the majority of them are introduced at the very beginning of the whole process. The idea is that by the time you have reached the stage of writing the H2020, you are confident that you are in the right track and you have many chances of having a winning application. Let’s see now the different stages in the proposal development cycle along with the 15 “traffic lights” that have to be addressed. Stage 1: Identification of the most promising and appropriate H2020 call according to our organisation’s/unit’s experience or idea. At this stage, we don’t necessarily need to have a proposal idea already envisioned (although it would be useful) but we need to identify those calls that are more suitable and attractive based on our organisation’s/unit’s experiences and resources. In this respect, for each candidate H2020 call, the RM&As should introduce the following “traffic lights” in the given order since we cannot proceed to the next “traffic light” if we don’t have green light in the current one. 1st-The “Sustainability” traffic light –Does this call supports your mission and vision as organisation or unit? If your answer is “Maybe” then this traffic light is yellow and you proceed with caution but bear in mind that the more yellow traffic lights you pass in your way, the more compromises you make in the proposal development cycle and subsequently the less great your proposal is. And especially in H2020 only great proposals will get funded! 2nd – The “Positioning” traffic light: Can you develop and suggest a project similar in ambition, excellence, expectations and achievements with respect to the other projects that have been funded under a similar topic in the past by H2020 or by FP7 (if H2020 projects under the same area cannot be traced yet). The aim of this traffic light is for your organisation or unit to assess whether it has the necessary resources, ambition and processes for developing similar projects as the winning ones in the same area. If your answer is “No” then this traffic light is red and you stop there. It is very important to understand your anticipated positioning of your potential project with respect to what currently has been funded under related calls and be confident that your project is well positioned. If your answer is “Maybe” then this traffic light is yellow and you proceed with caution but bear in mind my comment on yellow traffic lights. 3rd – The “Eligibility” traffic light: Is your organisation eligible for participating under the same call? If your answer is “No” then this traffic light is red and you stop there the proposal development cycle. You can only look for opportunities to get involved in other H2020 projects under this call as indirect partner. There is no “May be” as answer here so there is no yellow traffic light. 4th – The “Feedback” traffic light: Can you get feedback from experts and EC officers that are active under this specific H2020 call? The objective of this traffic light is to ensure that you will be able to get feedback later in the proposal development process from individuals that are quite active under this call. Feedback can be on your proposal idea, on the proposal summary and on whether the identified call is the most suitable for this. If your answer is “No” then this traffic light is red and you stop there. Feedback from the proper actors is essential for developing a great proposal. 5th – The “Success Rate” traffic light: Are you comfortable with the success rate of this H2020 call (if applicable based on previous submission under similar calls)? The average success rate in H2020 currently is around 10% and there are H2020 calls that have even lower success rates. You need to feel confident that you have the experience and you can get the resources for developing a proposal that can be at the top winning ones. If your answer is “No” then this traffic light is red and you stop there. You need to convince first yourself and your team that as long as you follow specific techniques, tools and resources as well as ensure that you pass all the traffic lights with green, then you will have a winning outcome! 6th – The “Awards” traffic light: Are you comfortable with the no. of projects that are expected to get awarded a grant? 7th – The “Mark” traffic light: Are you comfortable with the total mark that the last project funded from the ranking list has received? The purpose here is to ensure that the total mark received from the last in the rank project funded from the previous call(s) is reachable and achievable by your project. If your answer is “No” then this traffic light is red and you stop there. 8th – The “Time” traffic light: Is there enough time ahead of you for developing a great H2020 before the submission deadline of this H2020 call? As soon as you have passed all these 8 traffic lights especially with green light, then you have completed successfully the Stage 1 in the proposal development process. Now you are confident that the identified H2020 call is the most promising and suitable for your organisation/unit based on their resources and experience. Now, you can start working on the second stage that is mastering the full proposal development cycle from initiating a great proposal idea up to its successful submission. Stage 2: Mastering the full Proposal Development Cycle. 9th – The “Internal” traffic light: Have you internally validated the value of your proposal idea and are you satisfied with it? 10th – The “External” traffic light: Have you externally validated your proposal idea and have received positive feedback? As soon as you have your proposal internally validated among your team and with some potential key partners, you need now to connect with experts and EC officers active in the targeted call and receive feedback on the value of your proposal idea as well as its suitability under that H2020 call. There are specific tips and hints on how to network and engage with externals but in any case we need to answer clearly the question related to this traffic light. If the answer is “No” then this traffic light is red and you stop there, you don’t proceed further and you rework your proposal idea until you have given the green light from the experts and EC officials. If you don’t get it, you stop there. 11th – The “Reference” traffic light: Have you studied all the reference documentation from the targeted call and understood it? Reference documentation can be any useful information provided by the EC in addition to the related workprogramme section that should be considered when writing the proposal application. E.g. Infoday’s material, Guide for Evaluators, FAQs for applicants but also for evaluators, any referenced studies or projects, etc. Ideally, in order to make sure that you understood it, you should prepare a 2 –page summary of the H2020 call that will contain the key points from the call that are essential to consider during the writing process of your proposal. If the answer is “No” then this traffic light is red and you stop there, you don’t proceed further and you read again the reference documents from the targeted call until you are confident with them. 12th – The “Summary” traffic light: Are you satisfied with the proposal summary of your H2020 project? There is a specific technique and step-by-step process on how to build a concise but at the same time coherent summary of your proposal. A great proposal summary can attract high-profile and competent partners, can engage the interest of stakeholders and end-users and it is an excellent platform for getting further feedback from experts and EC officials. Therefore, we need to be fully satisfied with the quality of our proposal summary. If your answer is “No” then this traffic light is red and you stop there, you rework the proposal summary until you are satisfied based also on the feedback received by experts and EC officials. If your answer is “Yes” then this traffic light now is green and you should have prepared an extraordinary proposal summary based also on feedback from experts, EC officials, other stakeholders and potential partners. You can proceed further now in the proposal development cycle and to the next traffic light. 13th – The “Consortium” traffic light: Does your consortium has the full value chain of partners as well as partners with the highest possible competence and expertise needed for your project? If you have built correctly your proposal summary, you should have identified specifically the profiles of expertise that you need in order to deliver a successful project. The stronger your consortium, the stronger the foundation of your proposal, therefore, the higher the mark that it can reach. A common mistake that many H2020 actors do is that they start writing the proposal without having the consortium finalised. It is like building a house without finishing the foundations first! The other mistake that they do is that they complete the consortium but it is rather weak with key profiles and expertise missing and consequently their foundation is again weak and it will be almost impossible for this proposal to reach a high mark and get awarded a grant. If the answer is “No” then this traffic light is red and you stop there, you don’t proceed further until you are confident that the consortium synthesis is of high value with all the key actors present. If your answer is “Maybe” then this traffic light is yellow. This is actually a traffic light that most of the H2020 applicants pass with yellow. However, it is critical to pass this traffic light with full green because otherwise the foundation of the proposal will not be that strong and unavoidably neither your proposal. If your answer is “Yes” then this traffic light now is green and you proceed further in the proposal development cycle and to the next traffic light. (yes, there are more traffic lights!). 14th – The “Team” traffic light: Do you have the proper team and resources on board for writing now the full proposal? a proposal leader that leads the proposal development cycle and makes sure that all traffic lights are passed with green. This person networks with potential partners for involving them in the consortium as well as with experts and EC officials for receiving valuable feedback. He/she coordinates the proposal writing and submission and assesses the quality of the contributions provided by the writing team members. The leader is normally part of the organisation that acts as the project coordinator. a writing team that writes the different application sections. Each team member should be allocated a different section according to their expertise. In any case, at least one member of the writing team should have high credentials in the domain/area that the proposal is focusing. The writing team can comprise members from the same organisation but preferably it should involve actors and expertise from the other consortium members also. an external evaluator that is not involved in the proposal writing so that he/she is not biased towards its quality that is responsible for evaluating the proposal idea, the proposal summary, the consortium and at least the final draft of the application by giving comments on what has to be improved. The external evaluator can be a colleague or a professional expert and an EC evaluator. A secretary that is responsible for collecting all administrative info and documentation necessary for the proposal submission. This person will ensure that the proposal is submitted properly and will allow the proposal leader along with the proposal writing team to focus on their tasks without worrying on any administrative stuff. The secretary normally is part of the coordinator’s organisation. If the answer is “No” then this traffic light is red and you stop there, you don’t proceed further until you have all the team on board along with clear tasks according to their role and expertise. If your answer is “Maybe” then this traffic light is yellow. This is actually a traffic light that most of the H2020 applicants pass with yellow. However, it is critical to pass this traffic light with full green since otherwise, team member roles are mixed (e.g. a leader can be also member of the writing team, or a member of the writing team acts as the secretary also, etc) and the team is not performing effectively and it is not possible to produce great results. 15th – The “C.R.I.T.E.R.I.A.” traffic light: Does your proposal excel in each element of the C.R.I.T.E.R.I.A. formula? If the answer in this traffic light is “No” then you have red and you stop there, you don’t submit the proposal until each element in the C.R.I.T.E.R.I.A. formula is addressed exceptionally. If your answer is “Maybe” then this traffic light is yellow. This is actually a traffic light that most (around 90%) of the H2020 applicants pass with yellow and this is one of the key reasons that they fail. If your answer is “Yes” then this traffic light now is green and congratulations since you have reached that far, you have managed to develop a great proposal. So, these are the 15 traffic lights along your way to a successful proposal and there are no short cuts here. You need to drive along a specific route and pass all the traffic lights with green in the given order and you will never be within the 90% of the failed proposals or among those entities that spent in total around 2 billion EUR for failing in H2020 as I have showed you at the beginning of this article. When you are following this route for one of your H2020 proposals and you realise along the way that you don’t have the time (possibly the submission deadline is very close) or the resources to pass a traffic light with green then my advice is to stop there until there is time and you have the necessary resources to continue towards the next one instead of proceeding with a “yellow traffic” light. However, you should not use the “yellow” or the “red” traffic lights as excuses for not getting more active in Horizon 2020. On the contrary, now you don’t have an excuse since you know what it takes to have a successful horizon 2020 proposal and you need to focus on making those “yellow” and “red” traffic lights into “green”. Now a last tip, as long as you have passed all 15 traffic lights with green and you have submitted the H2020 proposal, you need immediately after to celebrate! (Go for a drink or do something that would please you and your team!) Together with your team, you have two main reasons for celebrating. The first main reason is that going through this route with 15 traffic lights and passing all of them with green was a big effort and required a lot of resources and you need to celebrate this. The second reason is that by celebrating, your brain even unconsciously will motivate you and your team to go through the route with these 15 traffic lights with energy and resourcefulness at the next time you will be developing another Horizon 2020 proposal. So, don’t wait until you receive the evaluation summary report of your Horizon 2020 proposal. It will be too late and we should always find reasons for celebrating! It makes our job and our life more fulfilling and fun!